Even though I grew up in Tulsa, and graduated high school the year prior to the closing of Bishop's, I honestly don't believe that I ever ate there. Lady Tulsa Gal you are a gem. I've doing some mild research on Bishops for a story and you just filled in some serious blanks. M. Terry: Now you know why. My mother was the same way. Worker33: I thank you for the complement! 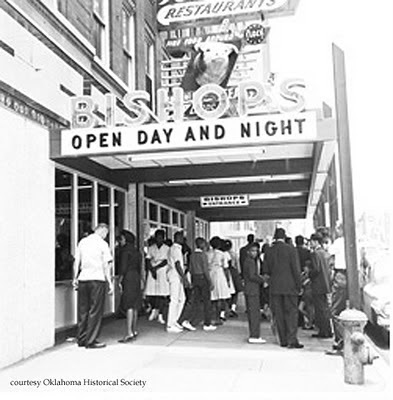 To it's credit the Tulsa Bishop's was not segregated by 1963. 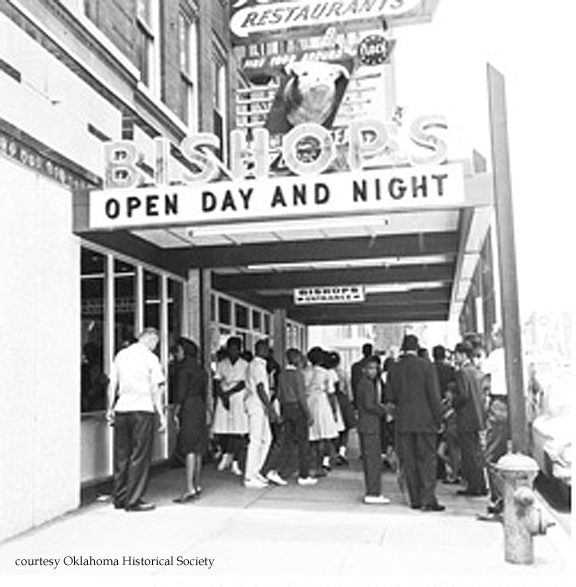 Consequently there were no sit-ins or picketing there in the spring of 1964 as there were in several other places in Tulsa before the demonstrations forced the city to pass a ordinance banning segregation of public places that summer. Anybody remember the "Midnight Special" from Bishop's? I think it was creamed chicken on toast - I remember having it as a child in the early 60's. Love the comments on Bishop's! 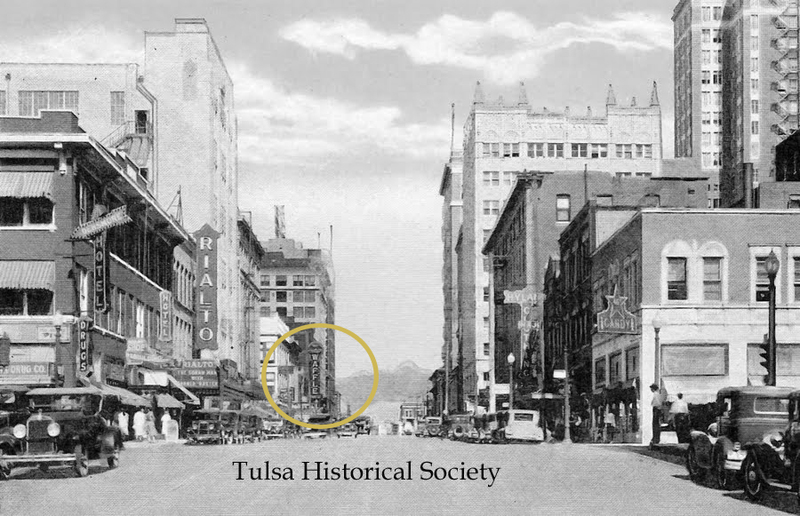 I don't think most people know that he also owned a large farm on the NW corner of 41st and Garnett Road, which is where Crossbow Shopping Center now is. I grew up there until I was in 3rd grade. My father worked for him, first in his restaurant, and then as his farm manager. His farm also included apartments, which he leased out, a main house, where we lived and another house for the farm hand. 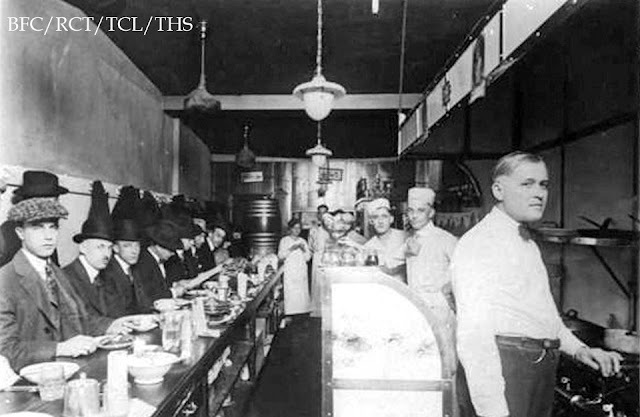 He raised almost everything he served at his restaurant on the property, which even included a processing area. In addition, Mr. Bishop raised horses and hunting dogs (his favorite was named Dottie). He was an avid hunter and fisherman and would take my dad on trips to Canada. We would visit his cabin in Arkansas frequently, which was a great get-away! I have home movies of us with him and his blue truck that he used for the restaurant and farm. He was a wonderful man and I never saw him treat anyone disrespectfully and was very generous to people. It was a great place to grow up! Well this is very exciting to find this!!! I'm the granddaughter of William Bishop and the daughter of Bill Bishop! My dad passed away 2 weeks ago and am soooo thankful for the comments. My dad was very kind and a loving. 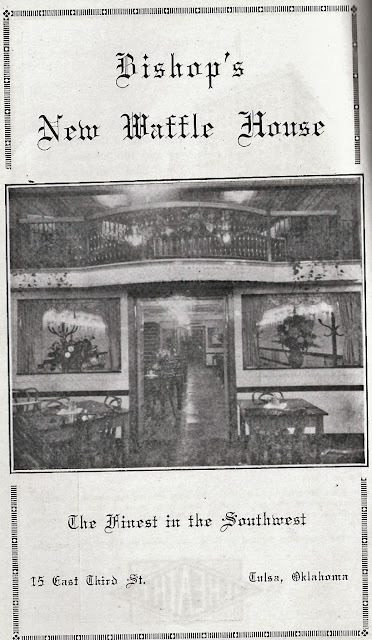 Seeing these pictures and your writing about the restaurant was a wonderful gift. Looking forward to having this for the reception, I know the family will be proud and surprised to see this.
. Ironically I married into the Arby's family!! 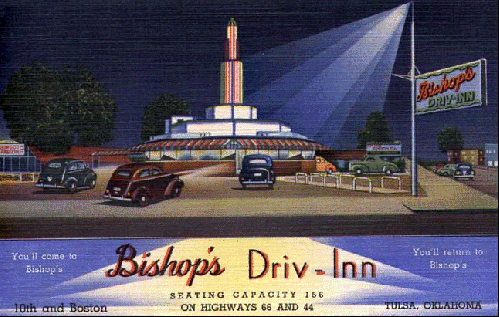 My FIRST date ever I went to dinner at Bishops and ate PAN FRIED STEAK WITH SHOESTRING FRIES. Served on a platter swimming with Au jus, then covered with the potatoes. OMGoodness, I can smell it now. 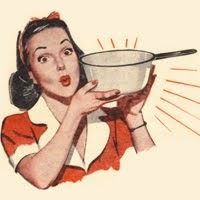 Any recipe out there for that one! Miss it still today. I remember the waiters had been there all their lives almost. 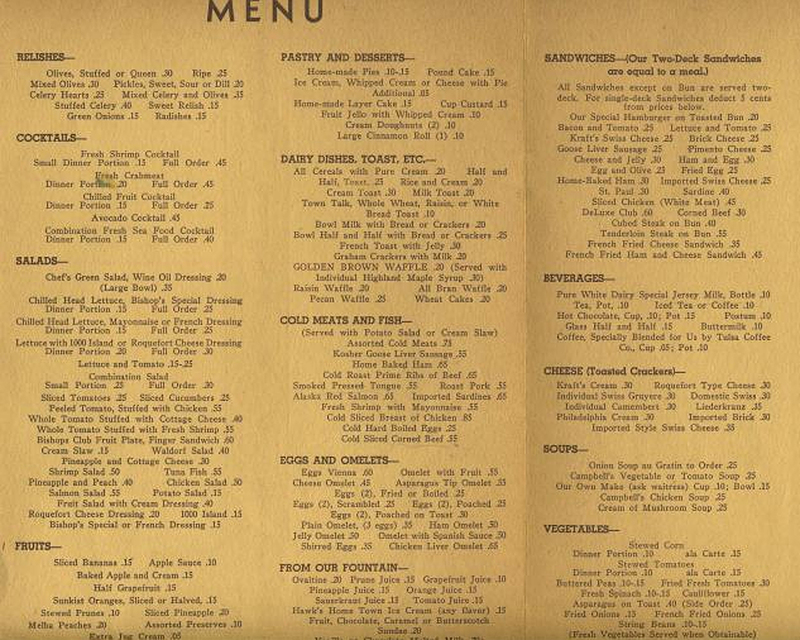 It was "THE PLACE TO GO" 24/7. I moved to Southern California in 1977 but come "home" once a year to smell the air, see my family, visit the family home,.....I do miss the sweet Spavinaw water, Bishop's and Penningtons! 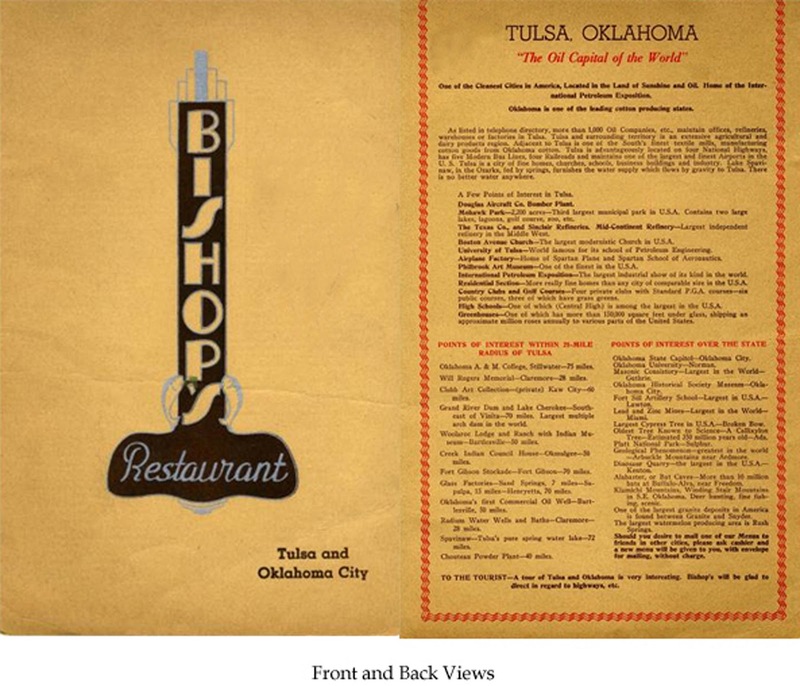 Tulsa Gal, thanks for sharing your interest and research of Bishop’s Restaurants in Tulsa and Oklahoma City (1912-1966). Although I never met him, I am the daughter-in-law of William Wallace Bishop. I married his only child, William W. Jr. in 1970. Bill had wonderful memories of growing up in his Dad’s restaurant, and working there as he grew up. His dad died in 1960, and shortly after, Bill was drafted into the Army to fight in Viet Nam. The restaurant was sold while he was overseas. 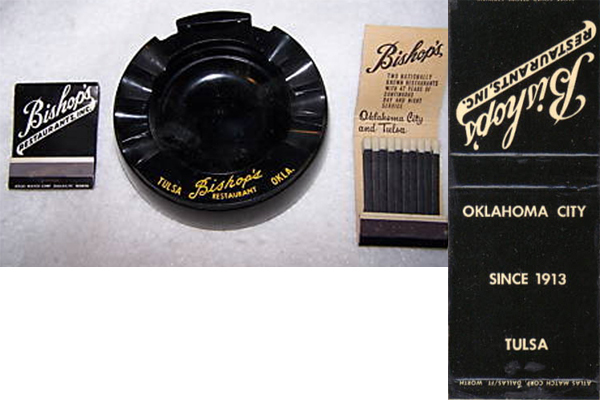 Through the years, the history of Bishop’s has been a source of pride for Bill and his family. 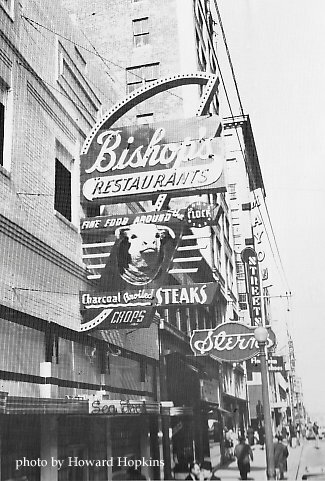 Stories of the restaurant, his dad, and the wonderful people who worked at Bishop’s became part of our memories and heritage. I am Mr. Bishop’s granddaughter. You may also know my father, Bill Bishop. Much of the history and info on this side of the family was lost with my father’s passing. I would love to connect with you and chat about your memories if you are available. Sure would love to visit. Was in Tulsa just last week. 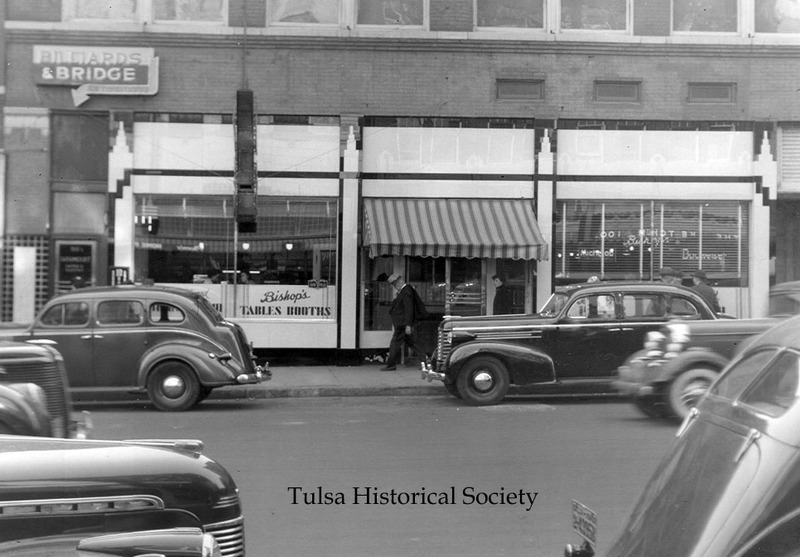 I have wonderful memories and with we could bring some of those great foods back to downtown Tulsa. Hello Mr. Bishop's granddaughter, I am Phyllis Brown one of the "Bishops" great admirers from the past, I will share my memories also. Great food and "the place to go after hours". I loved the Pan fried steak with shoestring potatoes. Pan Fried Steak for two, lots of steak juices on the platter but crispy thin shoestring fries all over the top. TOTAL YUMMY. Spent my first anniversary eating there after our "date" that night in March 1964. I also remember that our waiters were all much older men who had been there for so so so many years. Your Grand Dad must have been a really good man to keep people working with him for so many years. Kudos to your family, a great legacy indeed. Hi Phyllis, thanks for the comments! I love hearing about any memories others have of my grandfather I never got to meet him. Bishop’s sounds like it was a great place. I appreciate your input. The guy in the picture is an early Bishop's partner, a man I always called Gram-pa Byard. 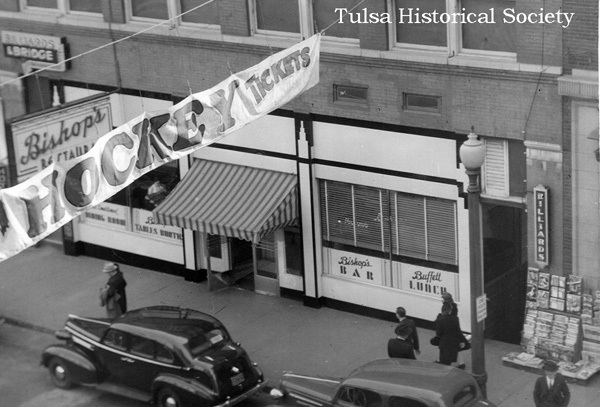 Cannot recall his first name, but he was an early Tulsa cafe guy. His son married by Aunt and his grandstands were my favorite cousins. I have a picture of him at my Aunt's Wedding at Holy Family and compared it to the one here. That is who it is. Thank you! Yes, we knew that was not a picture of W.W.Bishop, but we did not know who he was. Amazing to learn new info about people/ artifacts from long ago. my sister worked at the bishops in okc about 1960. she was going to beauty school. now i know where her recipe for rum cake came from. lol...she always brought one to holiday dinners. mystery solved.